Among the preseason favorites, UBC have had an up-and-down regular season—but don't count them out just yet. The #4 British Columbia Thunderbirds were a hot stock heading into this season. Fresh off a 2017 national semifinal appearance, UBC had a deep returning class, experienced rookies, and one of the best players in the division, Ellen Au-Yeung, at the helm. It was good enough to earn the Thunderbirds the #2 spot in the Ultiworld Preseason Power Rankings. After watching their comfort in stormy conditions at Bellingham Invite in January, I bought UBC stock by the barrel. They were better than Dartmouth!… better than those upstarts at UCSD!… better than everyone! Their stock started to cool somewhat when UBC went through the same regular season pains they usually do: in their first major test of the season they reached the Stanford Invite final, but lost handily to UCSD. Then they lost to Western Washington, Dartmouth, and North Carolina at Northwest Challenge. The hype train slowed on the track to nearly a dead stop. But I have faith in this team. They specialize in peaking late and several hours of study into the limited 2018 British Columbia footage supports my high preseason hopes. UBC could still be the best team in the division by the end of May. They are deeper than ever and their average skill level is the highest of any team’s. They’re fast, smart, and still a surprisingly young squad capable of further growth. 1. They’re the fastest team in the division. Other teams may have fast cutters and a quick handler or two. On the Thunderbirds, every player is footrace-ready. On the first cut off the pull, Au-Yeung jukes hard early to confuse her defender. After she passes, she destroys the Syzygy player up the line and gains at least 10 feet of separation in a matter of seconds. In the backfield, offensive handlers Esther Au, Serena Tam, and Janelle Siwa are in constant motion around the disc, making their resets active and tougher to shut down. Elsewhere, continuation cutters—even if their timing isn’t quite perfect or they are cut off and aren’t thrown to—frequently earn some serious space on their defenders, meaning the Thunderbirds have to throw very few contested passes. All of that means that if UBC can clear up some of their timing and get everyone on the same page, this offense could blow past anyone, moving up the field with ease. 2. They burn through zones. When they’re dialed in, the Thunderbirds can obliterate zones of any shape or size. The key to most great zone breaks is the initial throw through the cup. The skill and confidence to execute this type of throw is a calling card for UBC and most of their roster can pull it off, here demonstrated by center handler Tam. After breaking through the cup, UBC spreads the field well, sprays the disc out wide, and looks for quick continue passes, eating up huge chunks of real estate even against a very experienced zone team like the Psychos. Once the cup recovers and resets, the Thunderbirds recognize when to slow down and revert back to shorter passes to work up the field and eventually score. In this second clip—actually from earlier in the final—Esther Au quickly exploits the inside lane to hit Naomi Morcilla with that patented throw through the cup. Morcilla quickly turns and slings the disc wide to the waiting Au-Yeung, who rips the disc deep for a goal. Devastatingly efficient. Both of these clips are from Stanford Invite, where UBC was missing one of their primary offensive handlers, Judith Yeo. With Yeo in their zone offense, UBC’s field feels even bigger. 3. They have inside breaks for days. Inside breaks can be a blessing and a curse. When they work, they quickly and effectively open up a breakside lane to exploit. But it is tough for many throwers to consistently nail the speed and angle of these throws, especially in tight windows or in any kind of wind. Not so for British Columbia. At the Bellingham Invite, teams were forced to go directly into heavy, blustery wind that ruined most throws into the upwind endzone. But that wasn’t the case for Siwa or for Yeo. 4. They can rely on their younger players. The Thunderbirds relied on a young defensive line at Stanford Invite to get them to the Stanford Invite final, mixing first-year players with defensive stalwarts like Siwa and Paige Muir. 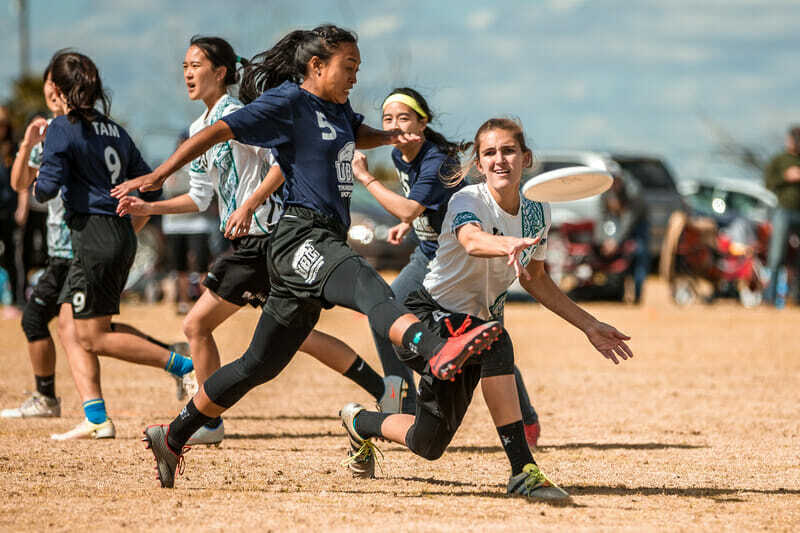 But UBC needed another handler who had the gumption to pick up the disc and rip it, and rookie Briana Wager1 is proudly taking up the mantle. Later in the point, Wager strikes to get open in the red zone. With chaos in front of her, she takes an option Mira Donaldson would have been proud of. The Thunderbirds’ new talent goes much deeper than just Wager, however. Monica Hsu, Naomi True, and Tony Li, all featured in the clip above, regularly contribute on UBC’s D-line. Five of the seven women in the clip above are first-year players for UBC, and UBC used versions of this defensive line often throughout the quarterfinal against Carleton, trusting these young players to convert. 5. They can work through progressions. Having all the individual skills in the world doesn’t matter if you can’t put it all together. Here, UBC’s speed, chemistry, and execution came together to make magic in this possession for a Thunderbird goal. Julia Zhang starts the play by pump-faking to a covered first look then whipping a low backhand break cross-field to Wager. Zhang pushes into the reset space, but she never stops moving. When she sees the play change, she quickly adjusts her direction and Paige Muir alertly bumps the disc to keep the forward momentum. In the red zone, after an initial strike cut fails to get open, Naomi Johnson jabs into the backfield space before cutting up the line for the easy goal. Just as importantly, the other cutters in the stack hold their position throughout this point and keep their defenders engaged, which gives Johnson the space in the endzone to work. This line works efficiently through options A and B several times with composure and speed—and this is British Columbia’s D-line. At their best, the Thunderbirds’ cutting lines are clean and they can outrun most teams in the division. 6. They have dominant playmakers when they need them. The UBC Thunderbirds have some of the division’s best-known names on their marquee, including Ellen Au-Yeung and Naomi Morcilla. Yet so far this season, the Thunderbirds have kept these women primarily on their offensive line, relying on the full depth of the roster to convert breaks. Au-Yeung gains most of her speed and yards in her first ten feet of sprinting, blowing past her defender. Even setting up with a bit of a cushion, the defender is left in the dust. In the few tournaments UBC played this season, they’ve shown an effective 3-person cup zone that they transition out of well. But this zone and their force forehand person defense have fallen short against teams like UCSD who can throw their way out of the zone. Last year, most of UBC’s creative looks appeared in the postseason, so it won’t be surprising if they pull out a few tricks come Regionals or Nationals. But the simple person-to-person force forehand defense they’ve shown so far in 2018 won’t be enough to get them past elite competition. Their offensive line features some of the Thunderbirds’ best players, but nevertheless this line has let teams stack up strings of breaks on them this season. Dartmouth built a 6-2 lead at Northwest Challenge and UCSD took half 7-2 in the Stanford Invite final. Granted, these break runs came from the #1 and #3 ranked teams in the division, but these are the kind of teams UBC will have to shut down in order to make a run in the bracket this year. UBC’s O-line is less impactful in the air than their D-line and this hurts them when they play physically imposing opponents who fast break into the deep space. If they share players like Naomi Johnson and Kaitlyn Harper across both lines in the postseason, their offensive line could better handle deep threats on the turn. UBC heads into Northwest Regionals next weekend as the no.1 seed yet again and despite their recent loss to Western Washington Chaos, they’re still my pick to win the region. But can they reach the national semifinals again this year? Yes. UBC has the depth and the talent to peak in postseason and surge past the pack. Hope you didn’t sell your stock too soon. Comments on "6 Reasons To Keep Your Eyes On The UBC Thunderbirds"